The phone book accesses the contacts and shows all contacts for which a phone number has been stored. The entries can be selected to make a call. A symbol indicates the storage location of the contacts. 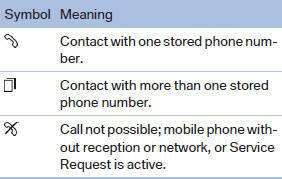 For contacts with one stored phone number: select the required contact. The connection is established. For contacts with more than one stored phone number: select the required contact and the phone number. The connection is established. Changing the entries in "Contacts". When a contact is changed, the changes are not stored on the mobile phone. A copy of the entry is stored in the vehicle. 3. "Edit entry" The contact can be edited.